A new deepwater will be constructed in Arkhangelsk in northwestern Russia. The Belkomur railway link the mining and industrial areas of the southern Urals to the port of Arkhangelsk. The new deepwater port of Arkhangelsk will handle 30 million tons of cargo annually by 2030. A newly-established company, Arctic Transport and Industrial Centre Arkhangelsk, has signed an agreement of intent with Poly International Holding Co. of Beijing for the construction of a new deepwater port 34 miles north of the city of Arkhangelsk in northwestern Russia. The port will be built near the Mudyug Island in the Dvina river delta, close to existing port facilities. Arkhangelsk regional authorities also aim at reaching an agreement with Poly Group to take construct the Belkomur railway link. The railway, 721 miles long, of which 267 miles already exist, will link the mining and industrial areas of the southern Ural Mountains to the port of Arkhangelsk. Officials estimate that the new deepwater port of Arkhangelsk will handle 30 million tons of cargo by 2030. 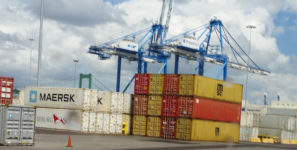 For Russia, the new port has the potential to be a central hub for exports and imports with Europe, the Asia-Pacific region, and North America. The port will have access to the Arctic Ocean via the Barents Sea and to the North Atlantic via the Barents and Norwegian seas. The port is planned for year-round shipping, and operations that will include the use of icebreakers during winter. With the building out of a deepwater port in Arkhangelsk, coal exports from Siberia will reach a port quicker than under the current scheme, which has them transported by rail to the port of Murmansk on the Barents Sea near Russia’s border with Finland. Murmansk is also upgrading its facilities with new terminals being built on the west side of the Kola Bay and a new 29-mile railway, currently under construction, planned to be operational by March 2018. The railway and new port facilities are parts of the Murmansk Transport Hub project, aimed at expanding cargo flows and year-round access to ice-free waters.